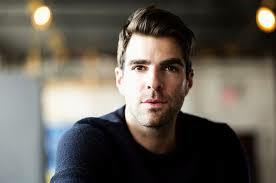 Zachary Quinto was born today, June 2, in 1977. He is an American actor and film producer. 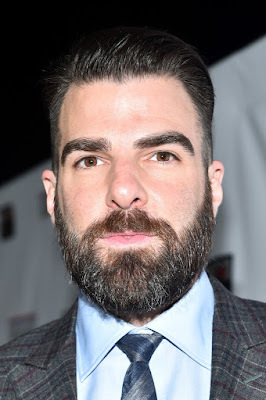 He is best known for his roles as Sylar on the science fiction drama series Heroes (2006–2010), Spock in the reboot of the Star Trek franchise, as well as his Emmy-nominated performance in American Horror Story: Asylum. Quinto was born in Pittsburgh, and grew up in the suburb of Green Tree, Pennsylvania. Quinto graduated from Central Catholic High School in 1995, where he participated in its musicals and won the Gene Kelly Award for Best Supporting Actor, and then attended Carnegie Mellon University's School of Drama, from which he graduated in 1999. Quinto first appeared on television in the short-lived television series The Others, and appeared as a guest star on shows including CSI, Touched by an Angel, Charmed, Six Feet Under, Lizzie McGuire, and L.A. Dragnet. In 2003, he landed a recurring role as computer expert Adam Kaufman on the Fox series 24; Quinto appeared in 23 episodes of the third season. In 2006, Quinto played the role of Sasan: the haughty, gay Iranian-American best friend of Tori Spelling on her VH1 series So NoTORIous. Later that year, he joined the cast of Heroes as Gabriel Gray, better known as the serial killer Sylar. He worked on the series until its cancellation in 2010 after four seasons. His casting as a young Spock in the J.J. Abrams-directed reboot of the Star Trek film franchise was officially announced at the 2007 Comic-Con. Speaking alongside Leonard Nimoy at a press conference to promote the first new Star Trek film, Quinto revealed that Nimoy had been given casting approval over who would play the role of the young Spock. "For me Leonard's involvement was only liberating, frankly," says Quinto. "I knew that he had approval over the actor that would play young Spock, so when I got the role I knew from the beginning it was with his blessing." 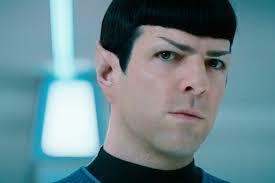 In a September 2008 interview, Abrams said of Quinto's performance as Spock: "Zachary brought a gravity and an incredible sense of humor, which is a wonderful combination because Spock's character is deceivingly complicated. The revelation for me watching the movie, when I finally got to watch the whole thing after working on sequences, was that he is extraordinary. He was doing things I didn't even realize while we were shooting – these amazing things to track his story." Quinto has also kept up his theatre experience, which includes roles in a variety of productions, including classics such as Samuel Beckett's Endgame at the Los Angeles Odyssey Theatres in 2003, Shakespeare's Much Ado About Nothing at the Los Angeles Shakespeare Festival and Intelligent Design of Jenny Chow at the Old Globe Theatre. From October 2010 to February 2011, Quinto played the lead role of Louis Ironson in an Off-Broadway revival of Tony Kushner's Angels in America at the Signature Theatre, New York City. For this role, Quinto received the Theatreworld Outstanding Debut Performance award. In 2013, Quinto played the role of Tom Wingfield in the American Repertory Theatre's production of The Glass Menagerie by Tennessee Williams. He was also in the Broadway reprisal of the production, in 2014. In 2010, Quinto's company Before the Door Pictures produced Margin Call, an independent film about the financial crisis. Quinto played the role of Peter Sullivan in the film, in a cast that included Jeremy Irons, Kevin Spacey, and Stanley Tucci. Margin Call received an Oscar nomination for Best Original Screenplay, by J. C. Chandor. Quinto was an executive producer for Chandor's next film All Is Lost (2013) with Robert Redford. Not leaving television behind, in October 2011, Quinto began a recurring role on the FX series American Horror Story as Chad, former owner of the house. Quinto returned for the second season in one of the lead roles, as Dr. Oliver Thredson. Movie-wise, Quinto reprised his role of Spock in Star Trek Into Darkness in 2013 and in Star Trek Beyond, released in 2016. In addition, he played John Smith in Hitman: Agent 47 in 2015. At the other end of the spectrum from the action-oriented Agent 47, Quinto appeared opposite James Franco in the drama I Am Michael (2015), a film that premiered at the Sundance Film Festival. In 2016, he portrayed journalist Glenn Greenwald in the Edward Snowden biopic Snowden, narrated, as space scientist Pascal Lee, in the documentary film Passage to Mars, and appeared as himself in the documentary film For the Love of Spock. Currently, Quinto is starring in the Broadway play, The Boys in the Band. It is being revived on Broadway for its 50th anniversary. The play revolves around a group of gay men who gather for a birthday party for Harold (Quinto) in New York City and was groundbreaking for its portrayal of gay life. The play has been called "A true theatrical game-changer. 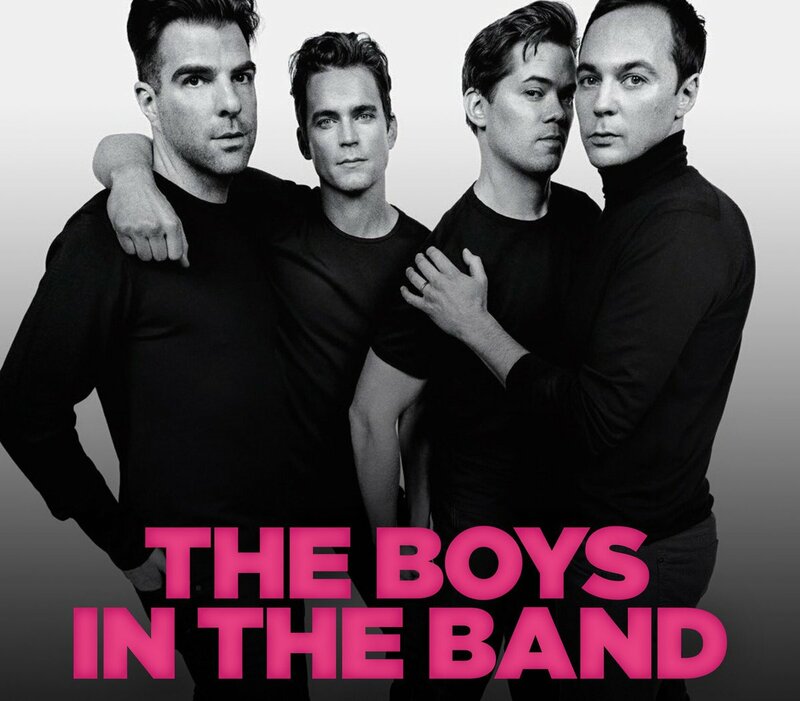 The Boys in the Band helped spark a revolution by putting gay men's lives onstage — unapologetically and without judgement — in a world that was not yet willing to fully accept them." Harold becomes increasingly morose about losing his youthful looks and claims that he no longer can attract cute young men. 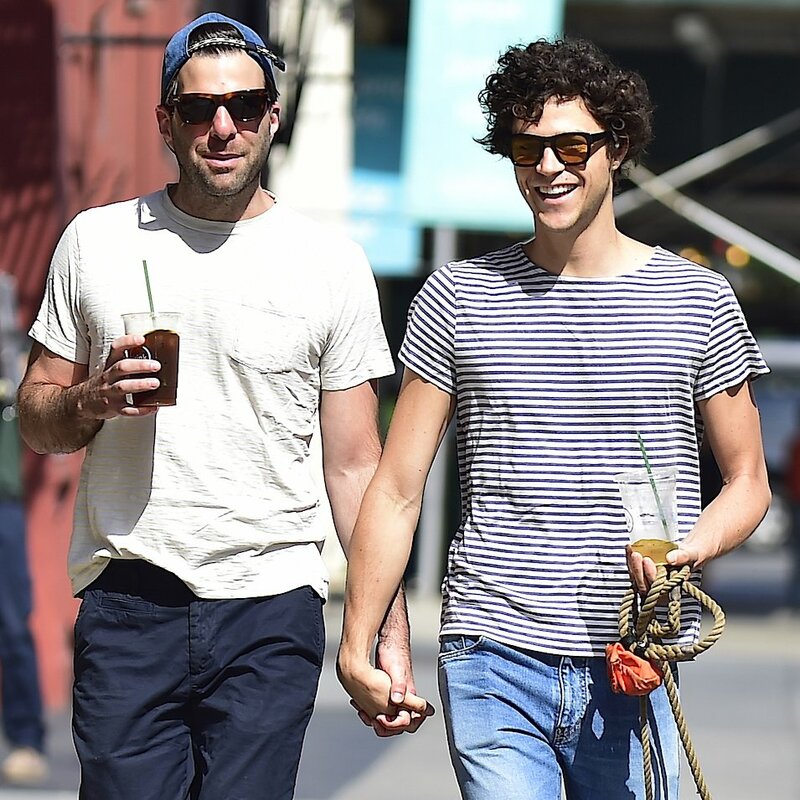 Quinto publicly came out as gay in October 2011. He explained that, after the suicide of bisexual teenager Jamey Rodemeyer, he realized "that living a gay life without publicly acknowledging it is simply not enough to make any significant contribution to the immense work that lies ahead on the road to complete equality." Prior to his coming out, Quinto had long been an active supporter of gay rights and organizations, including the Trevor Project. In 2009, he appeared in the one-night production Standing on Ceremony: The Gay Marriage Plays, a benefit stage reading in response to the passing of Proposition 8, as well as in the play The Laramie Project: 10 Years Later, about the 1998 murder of Matthew Shepard. In 2010, Quinto contributed a video to the It Gets Better Project, an Internet-based campaign that aims to prevent suicide among LGBT youth. In 2012 Quinto campaigned on behalf of Barack Obama, including appearing in the video Obama Pride: LGBT Americans For Obama. 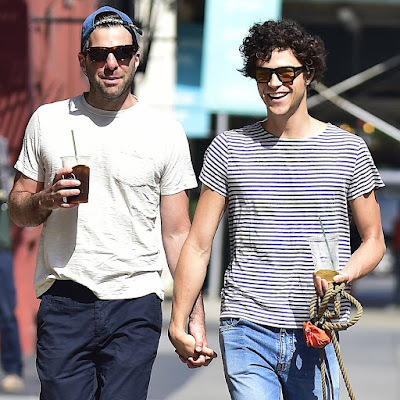 Quinto began dating model and painter Miles McMillan (Above with Quinto) in the summer of 2013. In early 2015, the couple moved into a New York apartment they purchased together. In November 2015 Vogue magazine called them "a power couple whose domain extends across the film, fashion, and art scene."